The CO2 transducer Cellar Safe was originally conceived to be used in fermentation. However, by now the CO2 transducer is used in various industrial sectors. It is most often used in the food industry, especially in the beverage industry. In addition to the pure detection of CO2, the gas transducer emits alarm signals when the legal limit values are surpassed (LED flash and a beeper). Additionally, you can use the connection relay to put into operation a ventilation plant that remains active until the CO2 content drops below the critical value again and there are no more risks for the personnel. As it is standard, the CO2 transducer is powered with 230 VAC, but an additional battery can optionally be inserted so that the system continues working if a power failure takes place. The life-span of the infrared sensor for CO2 is at least 5 years. An annual recalibration is recommended. If you are interested in seeing other models of gas transmitters that can measure different types of gases simultaneaously, click here. In case you have any question on the CO2 transducer, consult the technical data next or contact us: +44 ( 0 ) 2380 98703 0 . Our technicians and engineers will advise you on this CO2 transducer or any other product from our regulation and control systems, meters or scales of PCE Instruments. 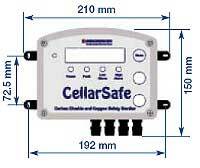 As mentioned above, the CO2 transducer Cellar Safe is very versatile. The image on the left shows the transducer during its installation in the premises of a factory. The image on the right illustrates a typical use of the transducer connected to a ventilator in the warehouses of a beer house. When the limit value is surpassed, the device activiates a wall ventilator until the value drops back below the limit and it is possible to return to the the warehouse. 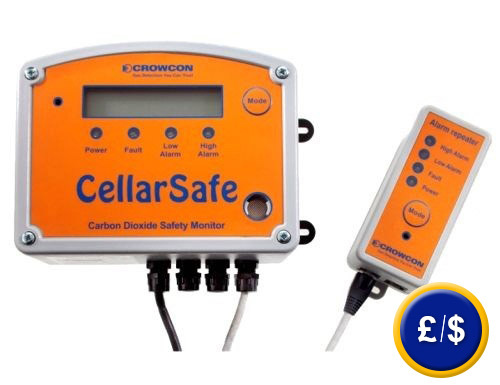 1 x CO2 transducer CS (Cellar Safe), 1 x factory calibration certificate, 1 x remote control, 1 x 9 m for the remote control, user instruction.